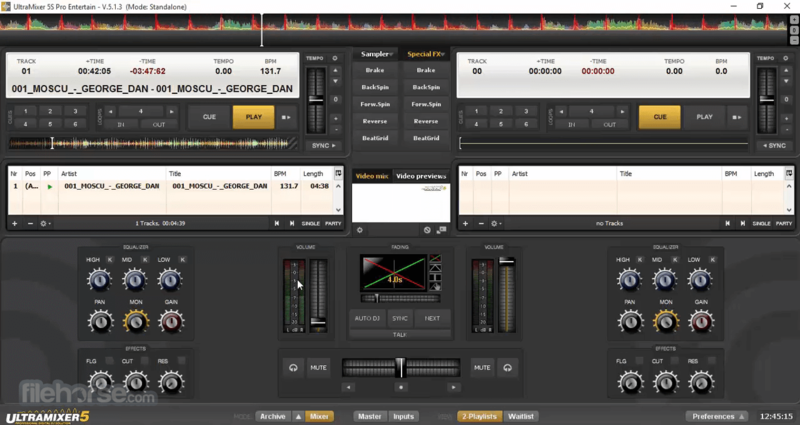 With UltraMixer for Windows 64bit you will become a “Mobile DJ 2.0“: Besides all common DJ-mix functions UltraMixer brings a lot of new entertainment possibilities. Just play music videos and karaoke songs as easily as “normal” audio songs. In case you do not have enough videos, Ultra Mixer brings live visuals in HD quality with 14 effects, to have always a suitable screen. By fireing up your images to a flat screen or a beamer your audience will be amazed. UltraMixer for Desktop unifies multiple software in one – an easy to use photo slide show comes along with the live visuals and video playback. Furthermore you can display a beautiful background image, an on-screen logo or your own images (e.g. menu cart or flyers). Finally the live text function (like “buffet is open”) and party games with the live camera function on a beamer are rounding up the portfolio. Even a transmission of a football world championship is possible due to the integration of network cameras. UltraMixer is the perfect tool to entertain your party crowd. Entertainment with Audio, Video & Karaoke, Live-Visuals, Live-Text, Slideshows, Live-Camera. UltraMixer offline installer well known and highly precise audio engine brings crystal clear and 100% unchanged (no artificial filters) sound. The stability of the audio playback is ensured even if the system is under high load circumstances. The integrated Auto-Sync mixes two music titles perfectly together and makes transitions easy – with a single mouse click. You will be supported by 7 real time effects, a unique 31-band equalizer, 6 hot cue buttons, smart synchronized loop and built-in 16 channel sample player. Countless widgets make it possible to easily adapt UltraMixer to your own needs. Even font sizes and font types can be changed with a simple mouse click. Different skins and color schemes bring diversity and individuality. UltraMixer has one of the most powerful music archives on the market. The technology base is a real data base, where you can quickly manage even more than hundred thousands music files. Finding suitable music is just a matter of seconds. Even a search in Youtube is possible and music files can be loaded and mixed directly in UltraMixer. 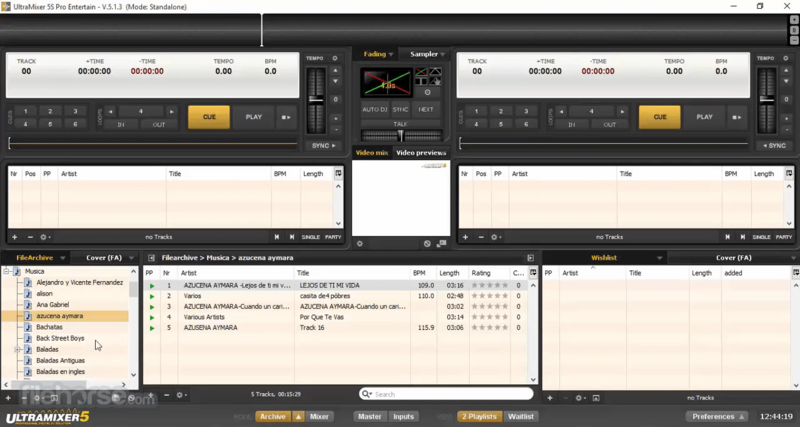 UltraMixer for PC latest version can be controlled by mouse & keyboard or all common MIDI-DJ controller. 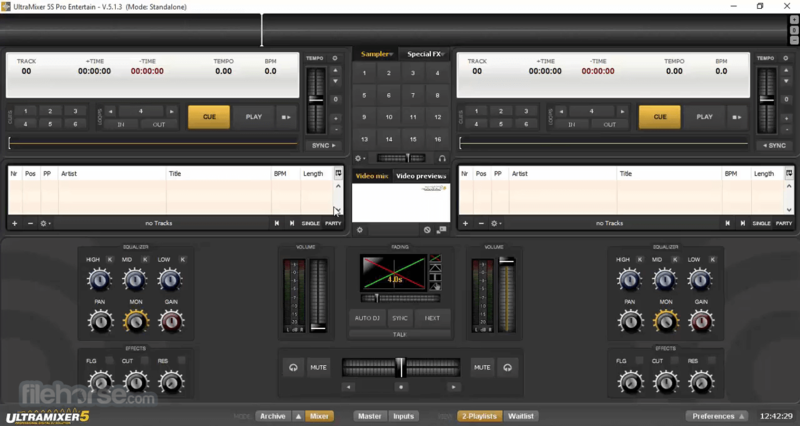 More than 70 controller mappings are directly included in UltraMixer – plugin and play. Note: The demo version is limited to 60 minutes sessions. Multi-channel sound card preferred.